The Marne department is at the very heart of the Champagne industry. 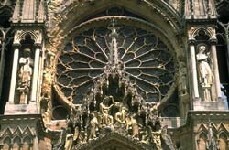 The de facto capital is stunning Reims, a name synonymous with sparkling wine production. Reims' wide streets and well cared for parks give it a very pleasant atmosphere. The Cathedral of Our Lady, richly decorated in Gothic style, is arguably France's most impressive religious building. It's no wonder that 34 French monarchs decided to use this as the venue for their coronations. Miraculously, the revolutionaries decided to spare the magnificent structure and it remains the main focal point of the city to this day. Both the cathedral and the half Romanesque, half Gothic Church of St-Remi, are listed as UNESCO World Heritage Sites. A visit to Reims is not complete until you have sampled at least one glass of the local speciality. There are a number of Champagne cellars to visit in the Place des Droits-de-l'Homme or the Place St-Nicaise, next to the Church of St-Remi. Maison Veuve Clicquot-Ponsardin is particularly recommended if you only have time to visit one of the cellars. Continuing on the Champagne trail, Epernay is a fairly affluent town whose economy revolves around the drink. It is located 25 km to the south of Reims, surrounded by a gentle landscape of rolling hills and vast vineyards. In total, the town boasts a staggering 200 miles of wine cellars for you to explore. At any one time you can expect tens of millions of bottles to be aging underneath your feet. The best selling Champagne in France is Mercier and their cellars are equally as top quality. To demonstrate the sheer size of their underground complex the owners once decided to hold a car rally here! The administrative capital of the department has recently changed its name from Chalons-sur-Marne to Chalons-en-Champagne to prevent visiting tourists from mistakenly going to Chalons-sur-Saune instead. Road signs have been changed but not everyone is used to the town's new name yet which of course only adds to the confusion! What people can agree on, however, is that this is somewhere well worth a visit, not least for a trip to its two beautiful churches. The marvellous Eglise Notre Dame-en-Vaux exudes gothic style coupled with distinct elements of Champagnois influence whilst behind the 17th century façade of the Cathedrale St-Etienne you can explore the original 13th Century construction. The nearest airports with direct flights to/from the UK are currently the two Parisian airports, Charles de Gaulle and d'Orly. The ferry or the Channel Tunnel are viable alternatives to flying. Ferries from the UK will take you to Dunkirk, Calais, Le Havre or Dieppe while you could also get a train from London to Paris and then change for one to Reims. Property prices are very high as the demand consistently outstrips supply. Extensive regeneration of Charlons-en-Champagne's shopping district and the construction of a new TGV link make the town a particularly good investment. The lack of rental properties in the department means that buying to let is considered a safe investment opportunity. Do you know Marne better than we do? Do you have photos of Marne? 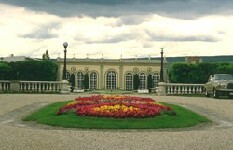 Marne is located in the centre of the Champagne-Ardenne region of France.